There are video editors that get the job done. And then there are video editors that go above and beyond. These are solutions that don’t compromise robust features yet they are user friendly, resource conservative, and speed up the process of rendering the edited content. They are a complete hub of all multi-media editing needs. And they are easy on the pocket. 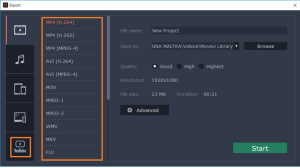 If you are scratching your head and can’t think of an example of a program that boasts all of these qualities, let us introduce you to the Movavi Video Editor. Home movie makers don’t really need a plethora of over the top features. If they have the functionalities they use on a daily basis organized in logical, convenient categories that are easy to access – they can cruise by and get the job done. Movavi is compatible with a large number of operating systems. Be it Windows or Mac, be it the older generation Vista or the next gen Windows 10, all machines turn into powerful editing devices with Movavi. 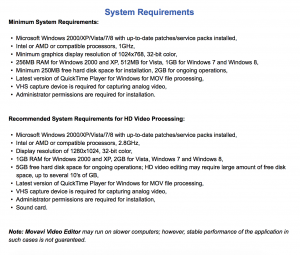 You don’t necessarily have to have gigabytes upon gigabytes of free RAM to edit video content quickly and efficiently. Most laptops and desktops play nice with Movavi. 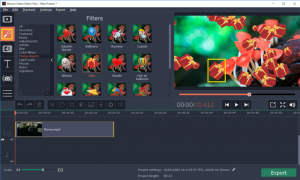 Movavi offers all the basic video editing tools. 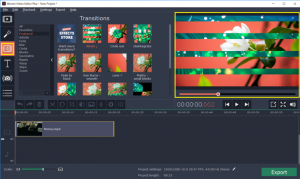 But it can simulate the prowess of more sophisticated editing platforms with its filters, transition effects and text placeholders. Your creativity is not restricted, even though the application is relatively light and streamlined. The Movavi interface.is.everything! Movavi has managed to keep its major features tabs conspicuous and has avoided unnecessary nesting of menus. You can access most options in three clicks from the workspace. The Preview Window, the Editing Timeline and the vertical stack of icons come together nice and clean for a software that doesn’t overwhelm. Speed speaks for Movavi. The dreaded 1:3 rule is flipped where Movavi is concerned. The rendering of the edited video takes significantly less than three times the length of the original clips. This is because Movavi isn’t resource hungry and makes the most of the processing cycles it uses. 1. Open a project in the FULL FEATURE MODE or EASY MODE from the welcome modal. When you hit the Movavi workspace, the start is already laid out for you. The default icon tab that’s chosen is the “Import” option. You can use “Add Media Files” to access the content on your hard drive. 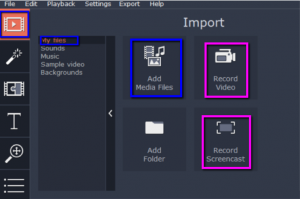 Or you can “Record Video” and “Record Screencast” using your device’s in-built camera and the Movavi provisions. It is a distinct convenience to have the ability to capture footage on the go or capture workflows on the computer screen without opening additional applications. 2. Next prep the clips you would like to join together and add the magic of special effects. You can clip, crop and saturate your video footage using the tools in the panel above the editing timeline. Click the magic wand icon and the puzzle piece icon to reveal 12 categories each of filters and transition effects. Filters add something extra to plain footage, sending flying objects across scenes or turning a particular shot emotional with a soft vignette. Transition effects are the backbone of editing. They help one scene blend into the next and take away abruptness from a storyline. Without transitions, a taut narrative is almost impossible. 3. Now play the entire edited movie clip and see the final result on the Preview Screen. If you are satisfied with the art you’ve produced, click the Export button in the top navigation and begin the process of rendering. You can choose to begin the export in one of more than 20 different output formats. It all depends on where you’ll be running the footage. Go for MP4 if you want to enjoy your movie on your laptop. Select the 4K television option if the content is best viewed on a large screen in Ultra HD. You can even process videos for PlayStation and Xbox. As you can see, the resolution can be adjusted and you get an idea of the file size of the video in your chosen format. Was that easy or was that easy? 3 clicks to all options and 3 steps to home movies. 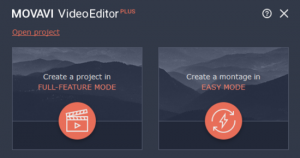 Movavi is, hands down, the best video editing program that is super easy to use!